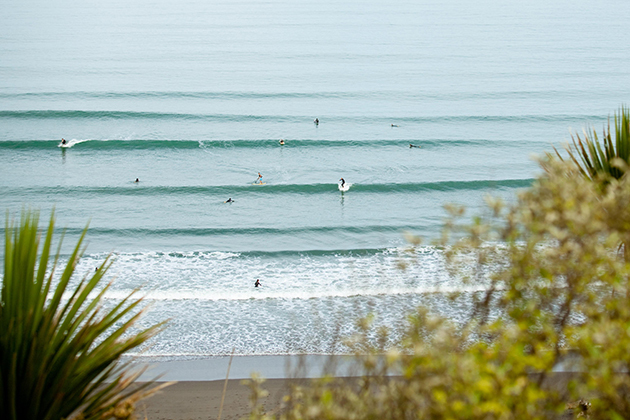 While the temperature is slowly rising in Raglan, so are the waters we surf in! Soon we will have some real nice summer waves coming up on our surfing beach in Raglan. You probably already know that Raglan’s pointbreaks are one of the most famous surfing breaks in the world. Every year thousands of surfers make a quick stop (and some never leave) to surf the long perfect walls of the point. As a beginner it can be quite intimidating paddling out at the points. There are other people to deal with, rocks, big waves and surfing etiquette. Not the ideal place to learn to surf! Luckily there is a perfect beginners surfing beach , it’s called Ngarunui Beach. Ideal for learning and Longboarding. Soft, gentle waves come in clean lines towards the beach making for rides over a 100 meters! Now how’s that for a first wave? Join our certified surf instructors at the Raglan Surfing School for a whole morning or afternoon of fun. They will teach the students all about rips & currents, beach safety, how to stand up and much more.